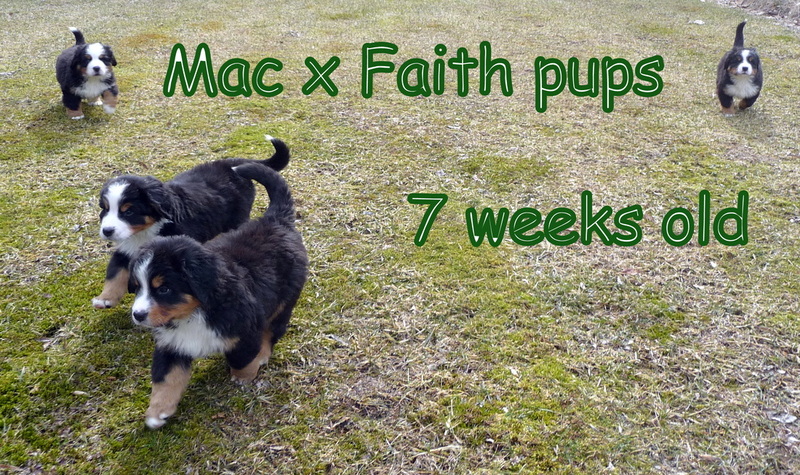 SIX PUPPIES (two boys & four girls) ARRIVED AUGUST 1, 2010! Gaston is a single puppy out of Rufio & Sierra, born in Boulder, Colorado & living in Rochester, NY. Rufio and his owners, Sara Karl and Lynn Wood were very gracious with their time and care of Sierra.Sierra was a great mom. Megan was a wonderful first time puppy mother! a surprise as the veterinarian who examined her dam following a negative pregnancy test, told us that she was NOT pregnant! Carlos lives in southern California and leads a very happy life with his family- eating a healthy diet and getting lots of attention from all. Nine puppies were born but only six survived. Bette matured to be one of our very best, sweetest girls. Griffin celebrated his 10th birthday in 2012! Our first puppy that we bred... Molly, out of our Hans and our Leia (Ch Erlo vom Obwalderhof and Ch Kd's Princess Leia's Ovation, both awarded BMDCA Versatility Dog). 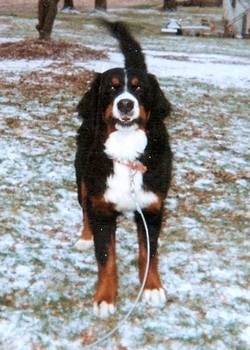 She was a wonderful girl for her family and once as a puppy, stopped a run away horse that she didn't even know, by grabbing the dangling lead! Molly had many adventures, including surviving parvovirus at 3 months old, followed right after that by a broken leg due to her weakened condition. Molly decided that her job was to be the guardian of her family's baby while on outings in her stroller.